Bad weather can cause poor field conditions and cancellations of games and practices. Fairfax County reviews the field status and issues field closure status on the Fairfax County Web Site by 3:00 pm each week day. On weekends, Pioneer will make our own field status determinations. Even if the County doesn't close fields, we may need to close a field based on our own determination. Generally, this determination is with the League Administrators and/or coaches involved in the event, practice or game. Pioneer has adopted Clermont Park Fields #1 and #4. This allows Pioneer to make our own determination on these fields and we might open those fields when other county fields are closed. We will normally update make a determination on field status as early as we can, by 3:30 pm on weekdays and by 9:00 am on weekends. We will then update our league website and coaches will notify teams as early as possible. (b) the sight of lightning. No player will be permitted to remain on the field, spectator areas outside the field, or in open dugouts for any reason. Coaches are urged to monitor weather conditions and to use their best judgment regarding adverse weather. A coach may postpone or cancel practice at any time that he or she believes that it is unsafe to continue for any weather related reason. A game may resume following suspension, at the discretion of the Umpire, if no thunder is heard or lightning is observed for a period of 30 minutes. Coaches are responsible for providing shelter to any members of the team who do not have a parent or other adult present at the field. Coaches should advise parents of this severe weather policy and should obtain contact information so that the coach can contact parents who leave their children at practice in the event of a suspension or cancellation. This policy is to the highest degree mandatory and shall be strictly enforced. This policy was created to ensure safety and to act as a guideline for board members, commissioners, coaches and assistants of all divisions through the Pioneer Baseball League. This policy does not expireand will remain in effect unless revoked an/or amended. Official Temperatures will be taken from (Click Here) The NOAA Heat Safety Tips & Resources, using Zip Code 22310, Alexandria, VA. All references forthis policy havebeen taken from the National Oceanic Atmospheric Administration (NOAA), the National Weather Service (NWS), and Fairfax County Public Schools (FCPS) Wet Bulb Temperature (WBT) guidelines. The NOAA's heat alert procedures are based on NOAA Heat Index Values (Click Here). The Heat Index, sometimes referred to as the apparent temperature and given in degrees Fahrenheit, is a measure of how hot it really feels when relative humidity is factored with the actual air temperature. EXTREME DANGER ZONE: ALL althletic events will be cancelled if the temperature reaches 107 degrees Fahrenheit, as identified on the Heat Index chart as extreme danger in red. DANGER ZONE: Use work-to-rest ratio with 20 minutes of activity followed by 5-to-10 minute rest and fluid breaks. EXTREME CAUTION: Regular Practices. Use work-to-rest ratio with 30 minutes of activity followed by 5-to-10 minute rest and fluid breaks. CAUTION/CAUTION: Regular Practices. Use work-to-rest ratio with 50 minutes of activity followed by 5-to-10 minute rest and fluid breaks. To prevent Heat Stroke, fluid breaks shouldbe scheduled for all athletic events and increased in frequency as the heat stress rises. Athletic events should be modified and/or cancelled to reflect the heat stress conditions. (Click here) The NOAA Common Heat Related Illnesses Info. (Heat Stroke, Heat Exhaustion, Heat Cramps). 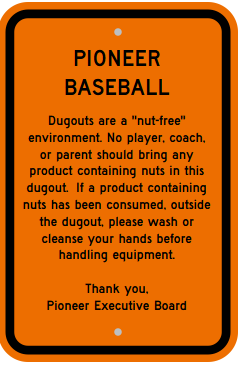 Starting in 2018, for both Spring and Fall seasons, Pioneer dugouts are a "nut-free" environment. No player, coach, or parent should bring any product containing nuts in any of the dugouts located on our game & practice fields, and must be consumed outside of the dugout. If a product containing nuts has been consumed, outside of the dugout, please wash or cleanse your hands before re-entering the dugout area, and handling equipment.